When this blog was born I promised myself that I would be in it for a minimum of 1 year before I decided if I would continue or not. Now 18 months in, I think it goes without saying that I am here to blog for the long term. I use the term blog loosely as this site is more a personal journal that I’ve made public to the world. As many of my regular readers know, most of the content is shared in the 1st person, with the occasional 2nd person point of view (for more on this check out this resource). Some posts have a bit of both…is that even allowed? What’s great about this blog update vs. the first couple I did at the 6-month and 1-year marks, is that I now can show year over year comparisons. Sessions, Users, & Pageviews are all up over 100%. The “Avg. Session Duration” has taken a dive of 30.9%. Honestly I think that has more to do with the fact that my time on the blog is now excluded from analytics (yep, I was my most loyal reader and analytics knew it…until I excluded my domain from analytics). I’m getting more traffic from social media and that tends to be less sticky. Meaning they come to read the article they clicked and then they leave. The “Bounce Rate” has gotten worse by 16.80%. I miss the days it was under 50%, but honestly the fact that it’s within arms distance of 50% given the traffic growth is amazing. I’ve seen many other blogs with a bounce rate north of 80%. February of 2015 – I was featured on two much bigger blogs: 1500days.com & FinancialSamurai.com. In both of these guests posts I shared a bit about my back story and where I come from and where I am headed. May of 2015 – I had a post shared on the Facebook page of The Penny Hoarder, funny thing is my site went down that day. Not because of the traffic spike, but because I didn’t know the share was going to take place that day and I was in the middle of switching hosting services. The good news is that the site was only down for about 5 hours. October/November of 2015 – This is the time frame I announced I was moving from a 2X per week posting schedule to a 1X per week in order to work on other aspects of growing the blog and to focus on the trajectory of my career that really took off in a big way in 2015. I actually expected traffic to drop more than it did when I switched to publishing 1X per week, but it really didn’t drop that much, especially considering I was posting half as much. March of 2016 – I finally started to see some traction from getting some new guest posts published again and I started focusing on social media a bit more. I am currently writing this with the benefit of hindsight and April has set new records due to a very well received guest post on 10 Guidelines to Financial Independence in 10-20 Years (which was my 2nd such appearance, it even got picked up by Rock Star Finance). It’s great to see a new high in page views, it only took 10 months from the previous high. But persistence is key. I am not as actively commenting on as many blogs as I did when I first started. My site is more seasoned with the search engines and I have much more content for Google to match search queries against and send me traffic. Also notice the huge increases in “organic” and “direct” traffic. I am surprised to see so much direct traffic (which means they are coming from either a bookmark or typing in the url manually). I guess I assume that everyone uses a blog aggregation tool like Feedly to manage blogs they frequent, but I guess not. My expectation is that the traffic driven by “social” should start increasing as a percent of the total based on a increased effort here (prior to the last month or so, I had not put any effort into social). It will be interesting to see how this changes when I do my next update for the 2 year mark. You can’t see it on the chart above, but in March of 2016 I had 75 email subscribers, over the course of the last 12-months that has increased 10X to almost 750 subscribers (actually almost 900 now as I edit this post). The site is now adding over 100 new email subscribers every month. And once signed up each subscriber is automatically put into my 24 week automated email series, where I share a lot more of my back story. I also give out some free tools and resources. This is one of the most rewarding aspects of running the blog, interacting with the readers through email. I have learned so much about so many different people from all over the world. It’s AMAZING! 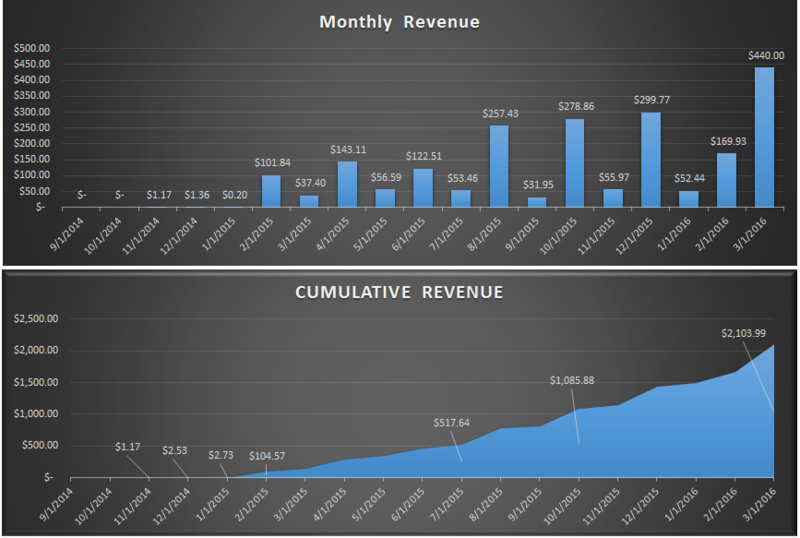 As you can see from the top chart, the monthly revenue can vary significantly. Life to date the site has generated $2,103.99. In Q1 of 2016 the site generated $662.37 in revenue vs. $139.44 in Q1 of 2015 (375% YoY increase). As of this writing, there have been 136 posts published, which translates into about $15.47/post (I won’t embarrass myself further by calculating the hourly wage I have earned). Total life to date pageviews were 153,674, which translates into about 1.4 cents per page view or about $13.68 for every 1,000 pageviews (what they call in the business ‘revenue per thousand’ visitors). I continue to reinvest everything the site makes into growing the site (through experimentation) and making the user experience better. Did you notice that the site has 70% less ads now than it had 6 months ago? Hopefully you have noticed a significant improvement in load times. The funny part is that I have 30% of the ads and I am making 3X as much money with ads now, then when I was running 10 ads from 3 different networks. A big part of that is that I found a finance specific ad network that pay significantly more per 1,000 impressions. Maybe this post has inspired you to create your own blog, if so, then you are in luck…today only you can get a free domain name and 12 months of hosting at $2.95/month. If you decide to start a blog today or in the future, be sure to check out the step by step guide I created for YOU here. Congratulations, Dom! I’m always happy to see your numbers and watch your continued success with the blog. It always gives me inspiration on where mine can eventually go. 🙂 I appreciate your insights here and keeping it 100!! The readability and the contents are amazing, this makes me want to come back often. Probably I have mentioned it earlier, the step by step guide is what I used to kick-start my journey. Glad you think so Santhosh and also happy to hear you found the guide useful in creating your own site. Great work, Dom! This is really impressive and also motivational for other new bloggers. It looks like you are growing at a great trajectory and I look forward to your next update! You’ve built a great blog. Keep up the good work. Thanks TGS! Next update will be at the 2 year mark. Congrats Dom! That is fantastic growth over the last 18 months. It is definitely motivation as I continue to work at growing mine as well. Just shows that if you are willing to work at it and put out great content, you can succeed. Great job! How long have you been blogging for now? Nice work! This is really inspiring for my journey and I’ve learned a lot from you already. I’m not too far away from your Q1 2015 – similar page views and just crossed 100 email subscribers. I guess people want to hear a young beginner’s take on investing in rental properties! Nice job. A good inspiration to get blogs started. How did you find add networks and can you share details on the finance specific ad network that pays significantly more via private email? Hey John – The most popular ad network that anyone can sign up for is Google Adsense (they may have requirements of your blog being around for 6 months). The other 2 popular ad networks that I recommend you check out are Media.Net and SOVRN. There are many more out there, and some are niche specific, just google it. You are very welcome! I am glad that it was a success, as we discussed via email, that is a way a guest post should work. To all bloggers reading this…to expand on point #5 above. Guests posts should be win/win/win!!! [Win #1] The content should be interesting and add value to the reader. [Win #2] The content should be up to par and something the blog owner is proud to publish on their site. And should gain them a lot of interaction. [Win #3] The content should be interesting enough to funnel some new readers to your own blog. Please don’t stop. This is by far and away my favourite blog. I really appreciate the detail that you provide and I recommend this site to most of my firms clients. I am a Business Development Manager at an accounting firm. We like to actually help our clients grow their businesses and as a consequence their personal wealth. The content on your blog is just really motivational for those of us who like to see a clear plan and the supporting numbers. And there aren’t any good personal finance sites from New Zealand. Nobody does motivational stuff like Americans. Thanks for the kind words Troy and thank you for referring people to the site to help it keep growing. It’s comments like these that keep me fired up to keep sharing. Stoked you find the level of transparency that I share motivational. Keep up the great work here bud, you’re doing awesome. Cheers to our journey. You bet Dividend Hustler. My hat tips to you as well, congrats on making it 15 months so far. I would recommend starting with SOVRN as your first ad network with Google Adsense or Media.net as secondary ad networks. Congratulations! That’s awesome progress you’ve made. We just started our blog a couple of months ago and still have a lot to learn. We appreciate the quality posts and the stats you’re sharing about your blog. Hopefully the next 18 months are exponentially better for you. J&D – Welcome to the awesome blogging community and congrats on taking the first step. Let me know if there is anything I can help you with. Thank you for the warm welcome. We may have to take you up on that offer for help sometime! 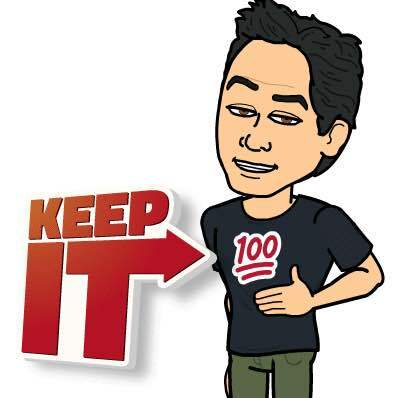 GYFG, you are likable, motivated, and on-the-reelz “Keeping It 100.” First learned of your efforts through your guest post(s) at Financial Samurai, and along with that blog and ESIMoney, yours is my regular stop. You and Mrs. GYFG are doing great, nothing surprises me in what you are accomplishing, and I mean that in the very best way. Continued success, your journey is just great and thanks for sharing it with us! JayCeezy – Very flattering comment, I appreciate the compliments and your continued support. The great thing about this site, which you’ve pointed out above, is the career aspects involved in your financial pursuit. As someone who relates more to your career aspirations versus the blogger status (although of course I too would love to have a self-sufficient blog), I enjoy the tracking and sharing of how your job income affects your life goals. It is truly something that is motivating. Thanks Sorro! Every endeavor in our lives plays a role in our ultimate destination. Glad the transparency and tracking has been motivating, that is what this blog aims to achieve. Dom, Strong work on the progress thus far, its great to see how the persistence materializes over time. I just hit the 9 month mark this May and look forward to reaching 18. Dr. J – Congrats on hitting the 9 month mark, only a few more months from hitting 1 year. Keep up the hard work! Thank you for your transparency, Dom. It is a great encouragement to me. I just concluded my first month of blogging, and I earned nearly $0.50. However, it was the most fun $0.50 I’ve ever earned. Congrats Finance Super Hero…Love the name by the way. Isn’t it funny how excited we can get earning pennies a day? Keep up the good work!!! Nice work on the blog and super congrats on making it to 18-month mark! Like you, I also keep my financial stats with full transparency as a motivational tool. It really helps to focus on the long term goals. Hi there! Why do you think your Organic traffic increased so much? Did you put any specific effort into SEO or organic/search discovery? Julie – The only thing that I did that may have enhanced the SEO effort is I started using the YOAST SEO plugin. Other than that I think a big part of it has to do with the seasoning of the site. I think search engines like sites that have been around longer. Also a lot more content on the site for Google and other search engines to index. I am sure guest posts help as well with all the links pointing back, which I think help build authority. Congrats on a successful year and a half of blogging! I love the emails that you send out that go through the top 10 list by the way. Great idea! I’m not sure where I’m going with my blog but it’s inspiring to see your numbers laid out! Thanks Millennial Boss! My only advice is to just have fun with it. Very cool to see! I just hit the 6 month mark. I decided to put my numbers up as well, mostly because love to see what others are doing. Your email list growth iso awesome. I just started working on that. Congrats Ms. Montana. Hitting the 6 month mark is the hardest and usually when most new bloggers throw in the towel. Here is to hitting 1 year.